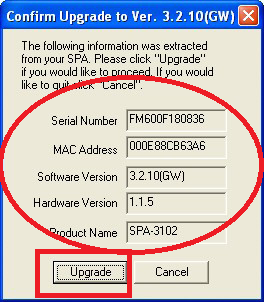 To upgrade the firmware in your SPA-3102 first download the latest firmware, unzip it and run the exe file provided. 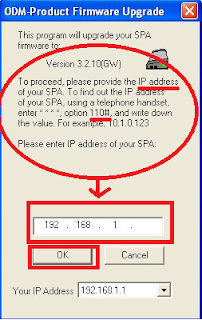 3-enter the IP address of your SPA into the spaces provided ,Click on the OK button to begin, so the program can find your SPA-3102. 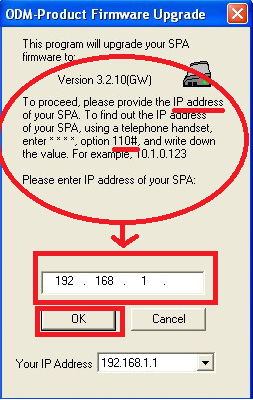 NOTE:Make sure the PSTN line is not connected on the FXO port of the SPA3102 while you dial ****110#. 5-Click on the Upgrade button to begin the upgrade procedure,Once it successfully finds the SPA3102, a window appears that confirms the Firmware Upgrade is successful.NOW reboot the unit and perform a test call.